Under each open net is there a History entry, which contains a list of the last 10 commands that were performed on the net and that can be undone. Under this entry there is an entry called Old history containing the preceding commands. These commands are the commands that can be un- and redone. 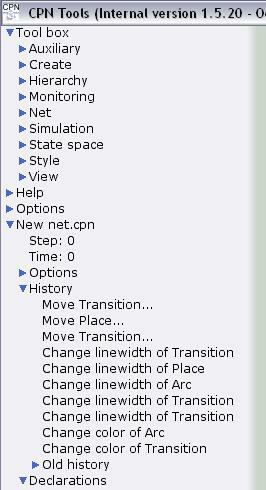 During the use of CPN Tools, the History is automatically updated. The command at the top of the list is the command that was most recently added. It is currently not possible to undo simulation commands. Nor is it possible to undo expand/collapse commands on index entries. After undoing a command, the name of the command will be dimmed in the History. Commands that have been undone can be redone using the Redo tool. After redoing commands, the names of the command will again be shown in black in the History. Applying the Undo tool to a command in the History, will undo a sequence of commands. The sequence starts at the top-most undoable command and ends at the command to which the tool was applied. A sequence of commands can be redone in a similar manner. 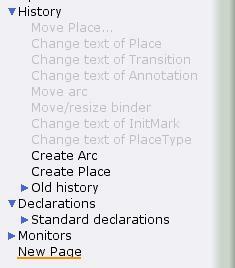 The Redo tool must be applied to a redoable command in the History list. 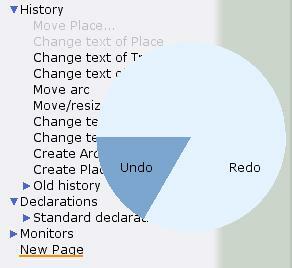 Applying the Undo tool anywhere else will only undo the last undoable command, i.e. it will undo the command closest to the top of the list that is shown in black. Similarly, applying the Redo tool anywhere else will only redo the last redoable command.